Tonight as I was filling haynets and making feeds Dustry took it upon him self to find something entertaining to do. 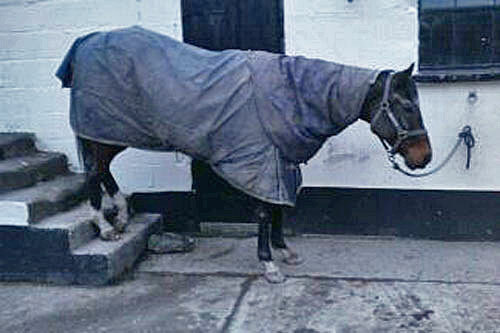 I couldn’t quite believe my eyes as I watched him reverse back up, and onto the mounting block. He was very careful about measuring the step with his toes and making sure he got his feet ‘just so’ on the step then he proceeded to stand there resting a leg, and looking pleased with himself until I went over and spoiled his fun by telling him to get down, and behave like a normal horse! I hoping it’s just ‘a phase he’s going through’ because at the moment having just turned 5yrs ‘he’s at a funny age’. There’s never a dull moment when you own thorougbreds! GHE comes 2nd in the ESMA’s!